This spring I decided to forego ordering chicks from one of the large hatcheries, which has been my M.O. the last couple of years, and instead try hatching some chicks myself. 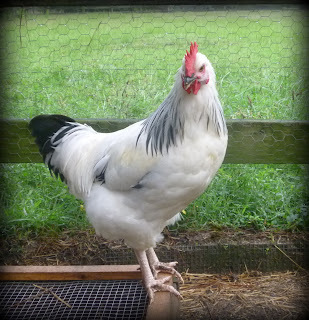 One of those breeds I decided to hatch is the Light Sussex. This was a new breed for me, but I was interested in raising a few because they are purportedly a friendly breed that are good layers of pink eggs. Out of the beautiful pink hatching eggs, emerged two tiny fluffy yellow chicks. 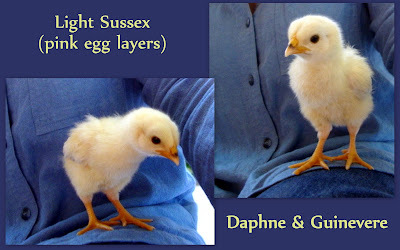 With fans' help I named the chicks Daphne and Guinevere. "Daphne" means bright, alert and playful, charming and elegant. One look at what Daphne will look like as an adult and you know the name fits. "Guinevere" means fair and white (how apropos!) and of course was the legendary Queen of King Arthur. Since this breed originated in England around the time of the Roman conquest in 43A.D., I thought Guinevere was the perfect name. By one week old it was clear this is a very friendly breed. Any time I took them out of the brooder, they seemed perfectly content to just stand on my lap. 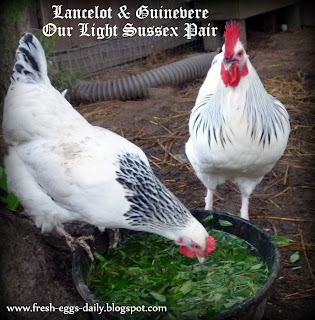 I had also ordered day old chicks from Chicken Scratch Poultry that arrived at the same time my eggs hatched, so one more Light Sussex joined Daphne and Guinevere in the brooder. By a week old they were already starting to lose their yellow chick fluff and one was even sporting a few tiny tail feathers! 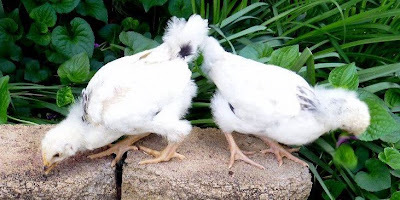 At a month old, their feathers were coming in white and the black markings had started to emerge. True to the breed, the three of them continued to be curious, friendly chicks, having a grand time exploring the ground outside their coop as I snapped photos. By five weeks, it was clear that I had a rooster. It's hard to tell roos from hens at this young age, but by comparing chicks of the same breed and age, it can sometimes become apparent at an early age. One chick's comb was much larger, turning red and he was already starting to grow wattles. His legs are thicker and he is more stocky than the two females. 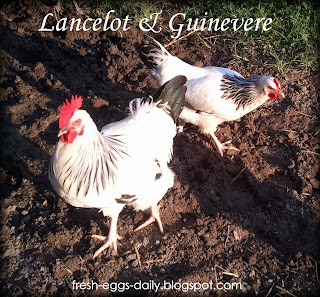 So it looks like we have a Lancelot for our Guinevere! I am enjoying watching the chicks change and grow. They were adorable chicks, are now gangly teens, and as adults they will be absolutely stunning. Here is Lancelot at 16 weeks old...he's just gorgeous. And here are the hen and rooster together at about 18 weeks old. I am so glad I chose to raise a few Light Sussex. 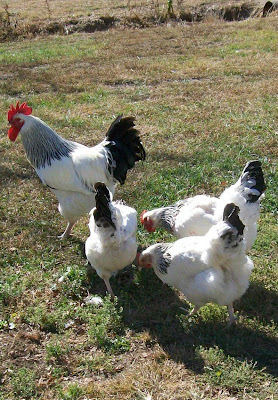 From everything I have seen, they will be extremely friendly hens and will add a nice bit of color to our flock, that up until now hasn't included any white chickens. And oooh, those pink eggs ! I can't wait. I've bookmarked their website and may order from them when we get the farm ready for chickens. Thanks for sharing your observations and pictures! What a beautiful breed and how nice you can keep your rooster. We are not supposed to have them here in the city only hens but on my morning walk the other day I heard one crowing. I loved it. Wonderful sound to me. If that's the same breed that I have, the rooster is quite docile. I love that. He has never even given me the skink eye. One difference is mine has feathers on his legs. Really a beautiful breed. Love those pink eggs. We are new at this and my daughter wants to show some Light Sussex birds at a fair. I am wondering at what age they would show best. Any input on that? Thx! Hi yes, I got mine from www.chickenscratchpoultry.com and am very pleased. They sell both chicks and eggs.